The 2016 SJJIF World Jiu-Jitsu Championship was a huge success with nearly 3000 competitors from over 45 different countries competing for the title of SJJIF Jiu-Jitsu World Champion. The tournament was hosted on November 12th and 13th at the Cal State Long Beach Walter Pyramid in California USA. On November 12th, as competitors arrived at the Walter Pyramid they were overwhelmed by the overall presentation of the event. The opening ceremony commenced at 9:45am with the introduction of the SJJIF President, Continental Council Vice-Presidents, and members of the national federation who made their way to the main table. The presentation of referees and referees directors, who were all in suit and tie, followed as they made their way to the main floor. Some referees made their way to the podium while others entered the mat area. As the referees directors stood at attention, the referees signaled the SJJIF staff to enter. What followed was nothing short of breath taking. The SJJIF staff walked into the competition area, each holding one of 68 national flags in honor of the countries that participated in SJJIF sanctioned events throughout the 2016 competition year and whose results contributed to the SJJIF world ranking. Led by two American flags, the SJJIF staff made their way to the podium where each member stood in attention holding their respective flags. Eyes were rich with emotion and pride as the opening ceremony left no doubt that this event was distinct from any others. The bleachers became fuller with arriving athletes, coaches, and spectators who were all cheering in appreciation of the opening ceremony. Attendees were asked to stand and the American national anthem was played in respect to the hosting country. The Brazilian national anthem followed in respect and acknowledgement to the roots of Brazilian Jiu-Jitsu. At 10:00 the event announcer welcomed everyone to the 2016 SJJIF World Jiu-Jitsu Championship, wishing all athletes the best of luck, and thanking all participants and sponsors for making this event a huge success. The event kicked off with the Kids NoGi division – what an amazing demonstration of technique and heart by our young athletes. 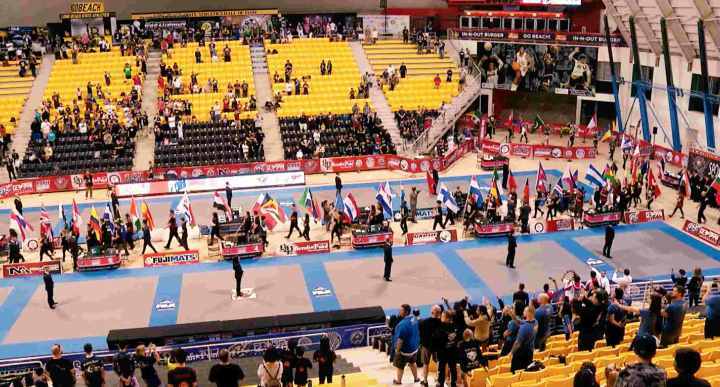 At the end of each division, athletes made their way to the podium where the next big development of the SJJIF World Jiu-Jitsu Championship was unveiled. As athletes were awarded their medals, the country flag of each competitor was displayed above the competitor. The SJJIF’s implementation of national flags signaled a new era for sport jiu-jitsu, where athletes were not only proud of their individual or team/academy victories, but proud to represent their own country. National pride was evident as it rippled through the arena and athletes from different teams began to cheer for their fellow national athletes. It truly gave goose bumps to see this unity amongst our athletes and to see the vigor in which the athletes began to compete with to place in the top 3 of their division. The Kids NoGi division concluded with the top 3 teams of the 2016 SJJIF World Jiu-Jitsu Championship being awarded their trophies. The top three teams competed against 500 teams/academies who participated in this year’s world event. First place was awarded to Aloisio Silva BJJ, second place was awarded to Ferny Jiu-Jitsu, and third place was awarded to Tahiti Nui. The SJJIF World trophies were followed by the SJJIF Kids NoGi Team of the Year trophies being awarded to the top 3 teams who accumulated the most points throughout all SJJIF sanctioned events throughout the world. This ranking included results from over 500 teams. First place was awarded to Aloisio Silva BJJ, second place was awarded to Ferny Jiu-Jitsu, and third place was awarded to C-Quence Jiu-Jitsu. Following the Kids NoGi trophy ceremony, the Adult Gi divisions commenced. The dedication and energy of these athletes was evident as they made their way to the mat area. Competitors had many matches in both men and women divisions and the degree of competition was intense. With the SJJIF rule of no advantages or referee decisions, competitors were really fighting for submissions and points. For the matches that went to sudden death it was an amazing experience to see entire teams uniting in force to cheer their athletes on to victory. On the podium you could see the importance of each medal as many athletes who placed first were promoted to the next belt by their professors as they stood on the podium. As many black belts competed for their world champion title another surprise from the SJJIF was unveiled. Black belts who made it to the podium were awarded their medals and given flowers to celebrate their victory. Some black belts were awarded big, white checks that symbolized their awarded cash prize. The 1st place champion was further celebrated and honored by having their national anthem play for all to hear throughout the arena. This was a remarkable moment for all athletes who truly understood the significance of the event, the shift in the SJJIF to not only recognize an athlete’s team/academy, but to recognize athletes as proud representatives of their country. At the end of the day, the top black belt athlete was Dany Gerard, a French Polynesia athlete who placed 1st in the black belt ultra heavy and open weight division. The Adult Gi division concluded with the top 3 teams of the 2016 SJJIF World Jiu-Jitsu Championship being awarded their trophies. First place was awarded to Checkmat, second place to Tinguinha BJJ, and third place to Aloisio Silva BJJ. The SJJIF World trophies were followed by the SJJIF Adult Gi Team of the Year trophies being awarded to the top 3 teams who accumulated the most points throughout all SJJIF sanctioned events throughout the world. This ranking included results from over 1000 adult teams. First place was awarded to Tree Rull BJJ from Japan, second place to Impacto Japan BJJ, and third place to Checkmat from the USA. This was the first time that two Japanese teams ranked as a top three SJJIF world team. The morning of November 13th found us back at Walter Pyramid where the tournament began with the Kids Gi division. With lots of kids competing for their titles, together with their families and teams, the pyramid got full very fast. The kids were ready and the level of competition was amazing. The technique that the kids displayed already shows the evolution of our sport. Kids from all over the world were competing for the top position on the podium and the loud and cheerful audience was remarkable and inspiring. Over 500 Kids team competed for the top 3 trophies at the 2016 SJJIF World Jiu-Jitsu Championship. The first place was awarded to Gracie Barra, second place to Checkmat, and third place to Lotus Club. The SJJIF World trophies were followed by the SJJIF Kids Gi Team of the Year trophies being awarded to the top 3 teams who accumulated the most points throughout all SJJIF sanctioned events throughout the world. First place was awarded to Gracie Barra, second place to Aloisio Silva BJJ, and third place to Checkmat. This concluded all kids competition for the 2016 SJJIF competition year and it was definitely an amazing experience. The Adults NoGi divisions immediately followed the Kids Gi trophy ceremony. It was amazing to see athletes of the same sport come out with so many different strategies. It seemed as if some athletes had transformed overnight with different levels of aggression, technique, and control. The podium was still an amazing experience with all athletes’ national flags displayed above them. Each athlete was able to experience the pride of not only representing themselves and team, but their nation. The black belt champions continued to have their national anthem play loudly as they received their medal. Sunday also found Dany Gerard from Tahiti, French Polynesia to be the champion of the black belt ultra heavy and open division. He made the French Polynesian anthem sound even louder as he won a total of 4 medals placing 1st in all black belt ultra heavy and open weight Gi and NoGi divisions. With over 80 athletes from Tahiti competing at this years SJJIF World Jiu-Jitsu Championship the arena was filled with loud and cheerful celebration for their ultimate champion. It was spectacular to witness! This moment was followed by an even greater promise of what the 2017 SJJIF Worlds event will hold. After Dany Gerard was awarded his medals and total prize money of $5,000 dollars, Marcus Almeida Buchecha got on the podium and challenged the champion Dany Gerard for the 2017 SJJIF World edition. The Adult NoGi division concluded with the top 3 teams of the 2016 SJJIF World Jiu-Jitsu Championship being awarded their trophies. First place was awarded to Tahiti Nui from French Polynesia, second place to Checkmat from the USA, and third place to Aloisio Silva BJJ from the USA. The SJJIF World trophies were followed by the SJJIF Adult NoGi Team of the Year trophies being awarded to the top 3 teams who accumulated the most points throughout all SJJIF sanctioned events throughout the world. This ranking included results from over 800 adult teams. First place was awarded to Aloisio Silva BJJ, second place to Checkmat, and third place to CMMA. The 2016 SJJIF World Jiu-Jitsu Championship closed with a highlight video of best SJJIF World moments and concluded with an invitation extended to all BJJ practitioners for the 2017 SJJIF World Jiu-Jitsu Championship. Post event, athletes, coaches, and spectators have acknowledged through social media the dedication and great work that the SJJIF has put into our sport and its community in just a few years. It is the SJJIF’s mission to take our sport to the Olympics and this event was a huge success!